Lighting designers and TV studios across the country have told us they are excited at the thought of having a direct LED replacement for our iconic fluorescent lights that have been key in producing beautiful video results for decades. The new 1SLED is the LED equivalent of our top selling and most versatile fixture, the 1SL. Typically used to key talent, the fixture has the versatility to perform side-fill or backfill applications. The photometrics are amazing! You asked for it! It’s an LED version of our popular fixture, the MSL, used as an accent light, side-fill or backlight on chroma key or interview sets. It’s also a great solution for low ceiling applications. Many people know Gus Hutchison as a formula race car driver who designed, built and manufactured racing engines prior to his career with KW/2 and PrimeTime Lighting Systems. This prolific engineer has designed over 2,000 lighting instruments with the same technical precision as his racing engines. Gus meticulously refined every feature of the LED Fresnel and built the optimal light to innovate your broadcast or production studio. 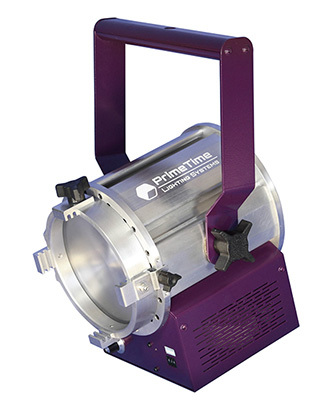 The GUS 41 LED Fresnel is a superior and innovative LED Fresnel lens spot to flood light designed and manufactured with PrimeTime Lighting Systems legendary performance, durability and quality. Applications include broadcast studios, production studios, house of worship lighting, and chroma key lighting.